on August 6th this year, in Taipei, Taiwan. The government of Taiwan is also supporting this event. we welcome people who are from many different organizations and practicing different styles of karate. We welcome your participation in our tournament and to commemorate the late Master Asai. We are also looking for organizations that are interested in co-hosting this event. Please fill in the attached form for “Friendly organizations and individuals,” and return it via email. Rebecca taught at Hambleton tonight and I stood in line training. Bex focused the first session around our young beginners, Louis, Finlay, Declan and George, building on what I had gone through last week. Bex started with revision of Choku Zuki and Oi Zuki and then taught Gyaku Zuki, continuing on with Mae Geri. At only 18 Rebecca is quite young to be instructing, but she always manages to deliver an aerobic , fun session with a high technical content. During the last 13 years of training and 11 years of being a kohai of Kato Sensei she must have paid attention at some point. During the second session I took the colour belts through Junro Shodan developing transition in stances, introducing Neko Ashi Dachi to Josh and David. A very big welcome to Sensei Fran who has returned to karate with her boys Louis and Finlay, Osu! I was very proud to present Jamie with the Trevor Jinks Cup tonight. The Cup is presented to a student who has tried hard throughout the year. They are usually not a natural karateka, someone who has had to work hard at getting to where the are along "the way". 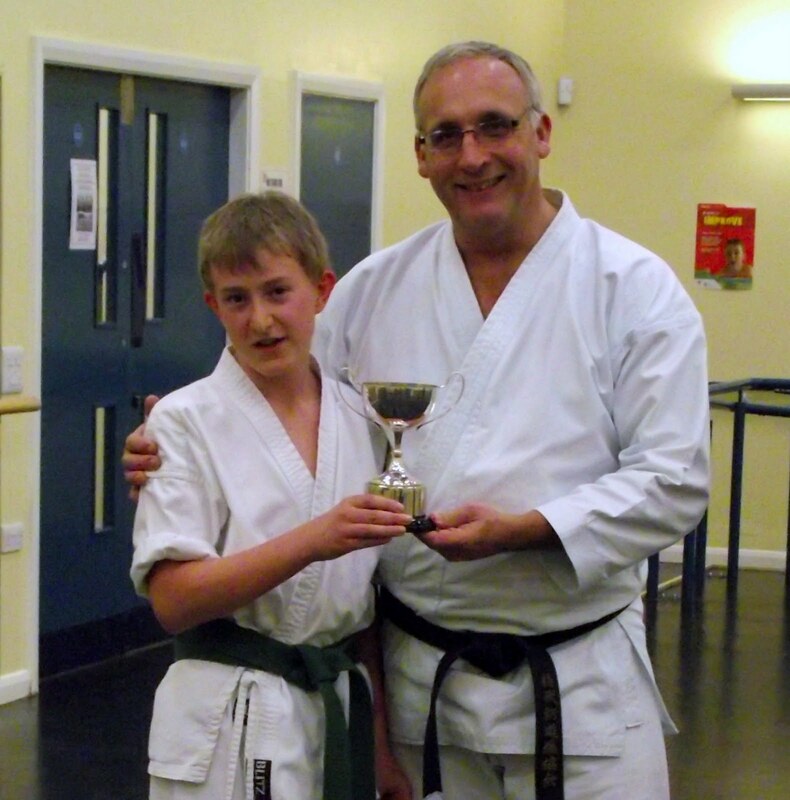 Jamie has attended regularly, he has often found it hard to concentrate in a class environment, however over the last 6 to 9 months he has worked hard to shut out distractions and concentrate on his karate-do. What has Jamie learnt that many others have not yet grasped.... You need to want to improve for yourself, not the desire of the parent or your instructor, you need to want to work hard for you. Many students are able to get to the mid Kyu grades with little or no effort, but to progress through purple and brown belt and on to Black Belt "you" need to work hard, "you" need to practice, "you" need to want to achieve what many desire, but few can be bothered to earn. Yes earn, every karateka will be given every support to achieve a Black Belt, but we can not do it for you, the karateka needs to want it. Below is a table of the first five recipients of the TJ Cup, not all have continued with their studies but what as an instructor is important to me is has Kartae improved the student as an individual? Have they improved as a person through karate-do? As "O" Sensei said Karate is about perfection of Character. Sensei Keith often talks about the circle of karate, with segments of Kata, Kihon and Kumite, Dojo training, self training competition etc etc, perhaps all the karate segments only form 50% of the circle, what is in the other 50%? In the words of Kato Sensei, "think of the answer to your own question and then we will discuss." 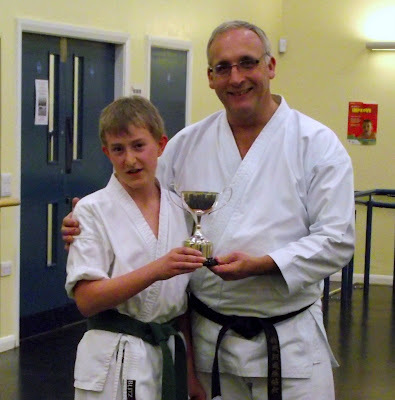 Too deep now, back to Jamie..
Jamie well done, you are deserving of the TJ Cup, set yourself a Karate goal..a black belt before you leave school? What ever it is work hard for me, more importantly work hard for you. Nothing would make me more proud than to have you kneeling at the front of the SSKC Christmas photo in 2014/5 /6 with a black belt round your waist, Osu!